Spice Village is in Kumily, a small settlement three kilometres from Thekkady, the main entrance to the Periyar Tiger Reserve. 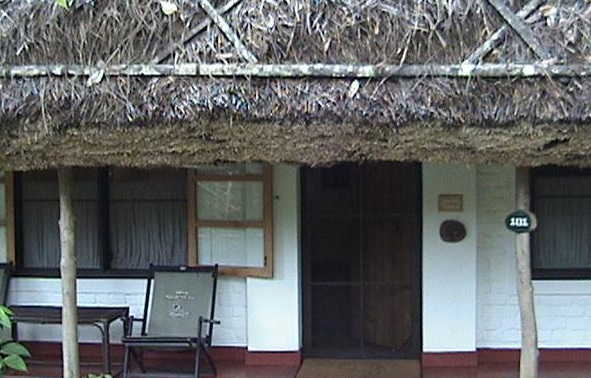 The design of each cottage was inspired by the native tribesmen of Periyar. At Spice Village, the guests get an opportunity to sample authentic Kerala dishes, prepared in local flavours. The meals served here taste best when they are enjoyed at an unhurried pace. Generous with spices and coconut, you can relish these dishes comfortably seated on the wooden tables. You can chose to have your meals outdoors , sitting on the veranda as well. When you are struck by the hunger pangs between your meals, head straight to the 'Tiffin room', and take a few light bites. The furniture in rosewood are pieces from a restaurant that was built a century ago. If you loved what you eat here and is waiting to experiment them at your kitchen, attend the cookery classes conducted here.